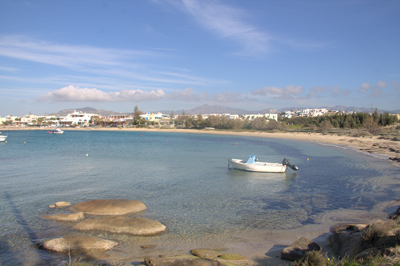 Top 10 Beaches in Naxos : Naxos, the largest island in Cyclades, has very beautiful and renowned beaches in the world. You will find either organized or virgins beaches, beaches for sports, discovery or families outing. 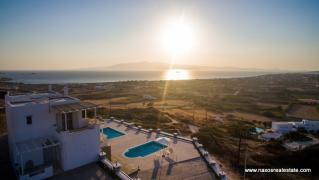 Additionally, you have the possibility to choose between beaches which are located one step far from Chora and beaches which are located in natural beauties and have not any cultural intervention. 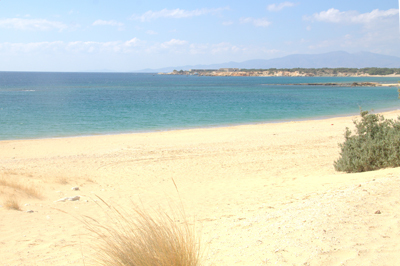 It is sure that Naxos beaches will amaze you. Discover them! Agia Anna is a very well organized beach with sun beds, umbrellas and water sports facilities especially for windsurfing. It has snow-white sand and transparent crystal clear waters. Close to Agia Anna are located a good quality restaurants, beach bars, café-bars, and everything which a family or a couple will need. The element that makes it mostly special is the small forest crowded with cedars which have literally germinated within the sand and make it seem like a gorgeous exotic place. Every summer a sea turtle visits this beach enjoying the swimming and the people there. Is one of the most organized beaches and it is among the 10 best beaches in Europe. It provides lots of facilities for swimming, sun bathing and water sports. It is very beautiful beach attracting a lot of tourists. Near the beach you will find shops, taverns, restaurants. It is a beach with thick sand and deep blue waters, with water sports facilities. You can access the beach using the bus in summer months. 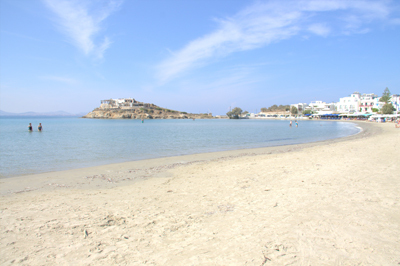 Is the most popular beach in Chora of Naxos. 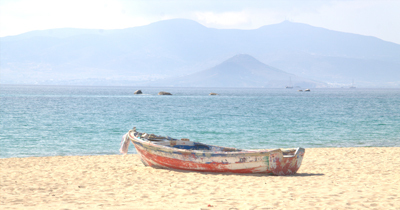 A splendid sandy beach with shallow waters, protected from the winds, ideal for children. There is an organized sports center operating with modern equipment for water sports. 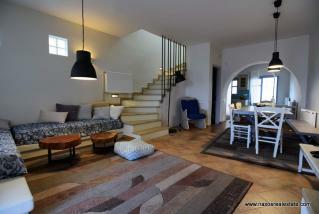 You will also find taverns, restaurants, beach bars and shops that meet all preferences. 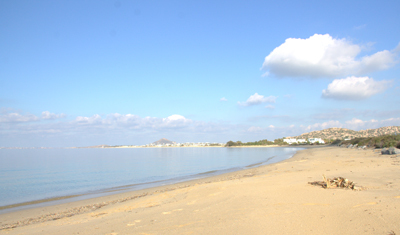 Plaka is the longest sandy beach (4km) that extends from Agia Anna beach. There you will find taverns and bars. Is an impressive huge and beautiful beach with sand, protected from the summer winds. In some spots you may find a natural shadow from cedars which germinate close to the sea, in August and flowers of the Sand. The beautiful sandy beach of Mikri Vigla is a meeting point for windsurfers from all around the world. There you will find some coastal taverns. 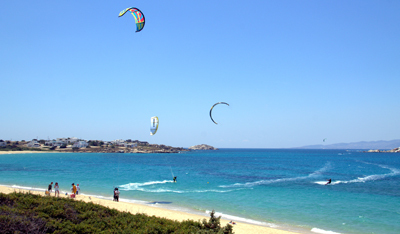 Mikri Vigla Naxos is extremely popular not only for bathers as there are many sheltered spots in the small bay to enjoy a swim and to shelter small boats when opening a dam but also to lovers of water sports, because here they will find ideal weather conditions for exercise at windsurfing and kite surfing. 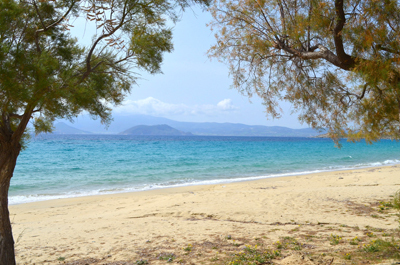 Kastraki is the longest beach in the island (3km) with white sand, blue green waters and sand hills with cedars. The beach is offered for relaxing, fishing and walks while there you can find lots of hospitable taverns. Locally there are nice rocky formations that create small secluded coves that allow anyone who wants to do naked bath. 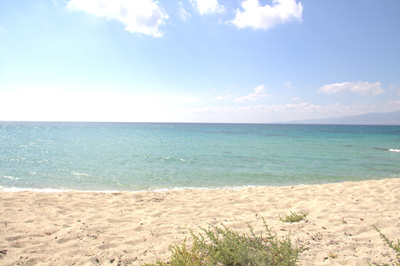 Orkos beach lies between Plaka and Mikri Vigla. It is a large sandy beach with cedar trees and is popular mainly for the fact that it is suitable for windsurfing, and therefore you will find shop equipment. 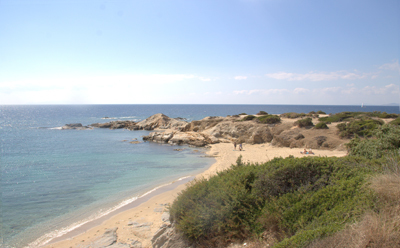 Orkos is composed of many smaller beaches. That makes the beach unique and amazing. In Alyko, three well hidden coves are waiting for you to visit. You may get all the things needed and you can stay until very late enjoying the magnificent sunset. This beach is among the best beaches in the island. 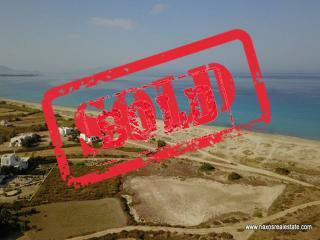 Covered by white sand and surrounded by cedars and reminds desert landscape. In Pyrgaki there are dunes and cedars that create a magical setting. Usually there aren’t so many people so you can enjoy the tranquility of the beach. Glyfada is the beach between Kastraki and Alyko, an open cove with white thin sand which is surrounded by cedars giving a thick shadow. It is a fairly secluded beach, but nevertheless you will find sun beds and umbrellas, and restaurants to dine.